Not all mattresses are created equally… and the Avocado Mattress is proof of that. If you’ve been mattress shopping, you may have found it confusing. There are mattresses designed to alleviate back pain, and there are beds made for side sleepers and people that snore. Then you need to decide on a mattress made from memory foam, coils or latex – there are pillow tops, smooth-tops, gel mattresses and even water beds. We know how frustrating it can be to find an affordable, healthy and green mattress but Avocado Green Mattress goes a step further and offers a vegan option for the discerning customer. No matter who will be sleeping on the mattress, you want to ensure that there’s nothing harmful – no toxins, no VOC's, chemicals and no carcinogens. We’ll explore more eco-friendly, natural and organic mattress materials as we progress in our Avocado Mattress review. When Avocado owners Jeff and Alexandra D’Andrea were shopping for a mattress in 2015, the options were few and far between. Either a mattress was affordable or it was eco-friendly. There was no “in between.” So they began to develop a mattress that was both environmentally-friendly and affordable for everyone. The result was the Avocado Green Mattress. What makes the Avocado Mattress different from others? It’s legitimately eco-friendly & vegan. This plush mattress combines materials such as renewable natural latex, certified organic cotton and natural wool to create a sleep experience like none other. We have found other mattresses can be made from materials which are harmful to both the environment and to your health. Unlike those beds, our review of Avocado Mattress shows no harsh chemicals and no dangerous toxins. When you sleep on the Avocado Mattress, you’re sleeping on a truly green bed. First and foremost, you want your mattress to be comfortable. Your mattress defines your sleep, and your sleep defines your health. The Avocado Mattress is the ultimate in eco friendly comfort. Firm yet contouring, the Avocado Mattress is nothing short of a well-balanced mattress. Whether you sleep on your side, your back or your stomach, the bed provides just the right amount of support to eliminate morning aches and pains – you’ll finally feel well rested. Avocado Mattress options range in thickness from 11 to 13 inches, and each mattress features an 8 inch support system so you awaken refreshed with no back pain. The Avocado Mattress is perfect on its own, but Avocado offers options to customize and improve your sleep experience. The standard mattress is 11 inches thick and offers a soft, yet supportive sleep experience, best for stomach and back sleepers. Avocado also offers a pillowtop mattress, perfect for back, stomach or side sleepers. Choose the pillow top and you’ll be enveloped into an additional 2 inches of 100% natural, sustainable latex foam. The pillowtop option offers pressure point relief for those with back pain, for athletes or just for those who prefer it. Our Avocado Mattress review focuses on the mattress, yet it wouldn’t be complete without mentioning the mattress toppers available from the company as well. 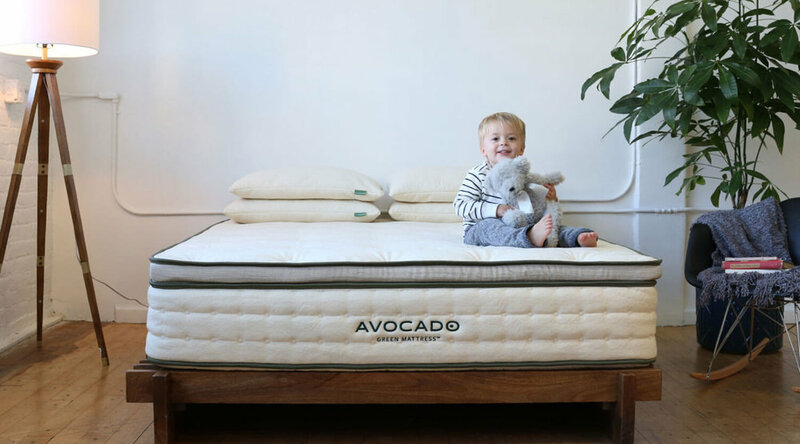 Avocado has developed two mattress toppers – one is a firm mattress topper and the other is a plush mattress topper. Add one of these mattress toppers over your Avocado Green Mattress for a fully customized mattress or improve your existing mattress. If you’ve been shopping for mattresses in stores, you’ve no doubt noticed that there’s a distinctive scent associated with the beds. It’s that “new mattress smell;” it may smell clean and fresh, but there’s a truth hiding in that scent. Traditional mattresses can contain dozens of harmful chemicals. Flame retardants, preservatives, insect repellents and more can be lurking in your mattress and your body is exposed to these chemicals as you sleep. Avocado Mattress avoids these chemicals and they’re filled with luxurious and natural materials for a comfortable night sleep. The Avocado difference is that your personal safety isn’t compromised for the sake of inferior, cost saving materials. In the USA and most other nations, mattresses are required to be flame retardant. While it’s possible to achieve this naturally, some manufacturers instead treat their mattresses with synthetic sprays and compounds. Flame retardants can be some of the most harmful chemicals in your mattress. Most are sprayed with a formula containing formaldehyde, boric acid, antimony oxide and more – all are toxic and even carcinogenic and can slowly leak from your mattress and into the environment and your body. Avocado Mattresses are treated with natural hydrated silica, a highly effective flame retardant. Hydrated silica is a natural substance, found in diatoms and it’s perfectly safe. So safe, in fact, that it’s used in the production of toothpaste and even malt beverages. The Avocado Green Mattress meets all requirements set by the US Consumer Product Safety Commission, without the use of toxic and carcinogenic chemicals. What, exactly, goes into an Avocado Green Mattress? First, the natural latex rubber. Renewable, sustainably sourced latex is crafted into foam using the Dunlop latex method – the most energy efficient method known to man. Avocado Green Mattress latex doesn’t emit the harmful chemicals of those other mattresses. You can “rest assured” of that. Joma Wool is grown in New Zealand and shipped to the United States to fill Avocado Green Mattresses. Crimped for maximum volume, Joma Wool is naturally anti-microbial, fire resistant and dust mite resistant. Our Avocado Mattress review wouldn’t be complete without mention of the organic cotton. Certified by the Global Organic Textile Standard, Avocado's cotton is soft, breathable and regulates your body temperature as you sleep. It doesn’t get much more natural than that. Avocado Mattresses vary in thickness, depending on whether you choose the standard mattress or the pillow top mattress option. Regardless of your choice, each mattress contains 8 inches of support coils to provide support you didn’t imagine possible. In fact, every mattress contains up to 1,414 support coils – made from recycled steel, to properly support you while you rest. Avocado's coil configuration within a mattress serves two purposes: to support and to transfer motion (so you do not feel your partner move). The higher the coil count, the more evenly distributed the support is within a mattress. Many manufacturers distribute coils primarily in the center of the bed. This may cause you to feel as if you’re “rolling off” the mattress. Avocado Mattress springs are divided into zones, providing support to each of your body parts and improves the distribution of your weight. Additionally, the edges of the Avocado Mattress are reinforced, so you have more usable sleeping space compared to mattresses without edge support. The coil system was durability tested by Leggett & Platt. The Avocado mattresses are made from recycled steel, encased in fabric, each coil in your bed is independent of one another, the coils in your Avocado Mattress are guaranteed to last. This allows for better joint, bone and muscle support... and you won’t feel your sleeping partner moving. We love sleeping uninterrupted through the night. 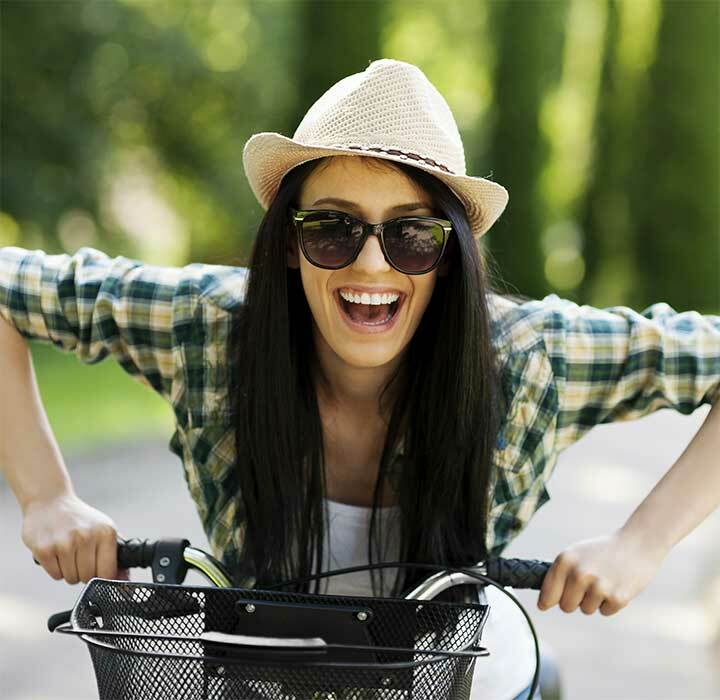 Choosing an environmentally friendly mattress doesn’t mean you have to sacrifice quality. Avocado Green Mattress owns their manufacturing facility and in doing so, have absolute control over sourcing responsibly and manufacturing in kind with the Earth. Between the organic cotton, the recycled steel, the Joma Wool and the sustainable latex, the Avocado Mattress is made with high quality materials. Luxury mattress features include the tufts to the positioning handles, the Avocado mattress is built to last. Hand-tufted rosettes atop the mattress are crafted from Joma wool. These tufts keep your mattress firm, flat and prevent bunching and shifting of materials. Your mattress is hand tufted by a person, not a machine, and there are no adhesives used. There’s no need to flip your Avocado Green Mattress, but should you choose to move it, you’ll be impressed by the strength of the handles. 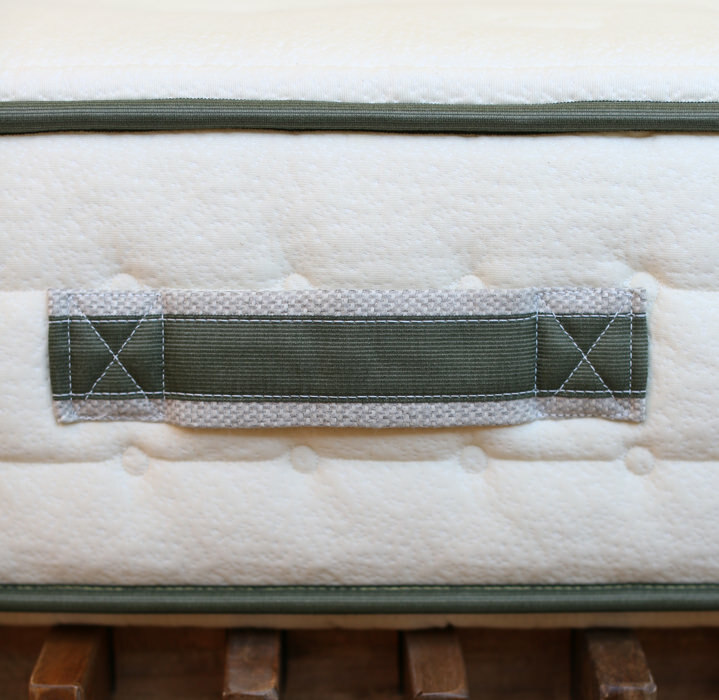 The handles are hand-sewn, secured tightly to the bed to prevent buckling. The attention to detail ensures you that Avocado mattresses are all produced as top quality organic green mattresses. 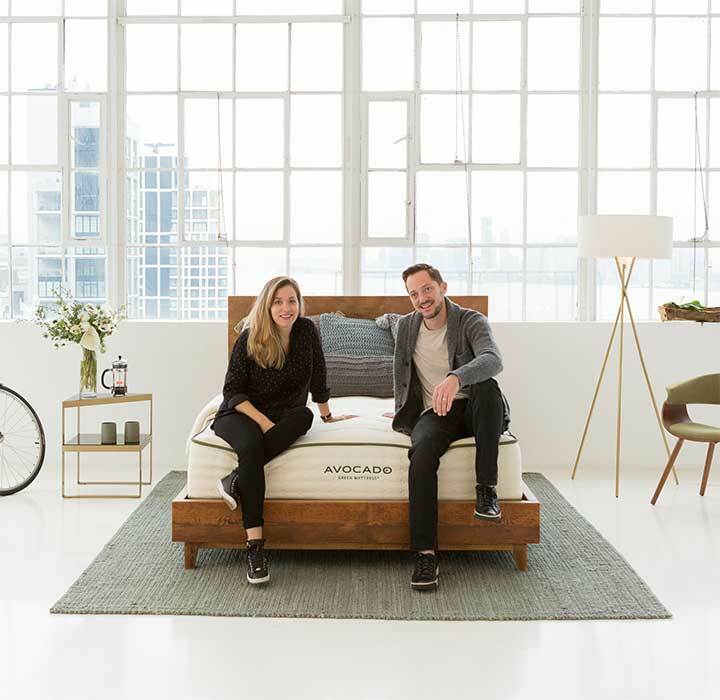 When Jeff and Alexandra D’Andrea founded Avocado Mattress, a driving factor was affordability. Green mattresses, made with sustainable, natural and eco-friendly materials, have historically been expensive. Prior to the Avocado Mattress, these environmentally sound mattress options were cost prohibitive. They began a mission to create a mattress that was socially and environmentally responsible that was affordable to everyone. So the Avocado Mattress was created with earth-friendly, budget conscious buyers in mind. The mattress is available in all sizes from Twin, Twin XL, Full, Queen, King and California King. Additionally, the mattresses are budget-friendly even when customized. Adding a pillow top to your Avocado Mattress costs just a little more. Additionally, you can customize the firmness of your mattress by choosing from one of Avocado’s mattress toppers to make it harder or more plush. Avocado Green Mattress is headquartered in the United States. The mattress technology is researched and developed in Hoboken, New Jersey. From New Jersey, we travel west to where the mattresses are hand crafted in California. All of Avocado Green Mattresses are made under fair working conditions. In health-conscious factories, American workers tuft each mattress, hand sew each zipper and double stitch each seam. If a material is not used, it is recycled and there’s no waste. Each mattress is made to order, as it’s ordered. When you order your Avocado Mattress, you’ll specify the size, the pillow top option and any other preferences. Then, a team of individuals in California will craft your mattress by hand, ensuring that your bed is individually created, just for you. Avocado is GreenGuard Gold Certified. GreenGuard Gold was formerly known as the GreenGuard Children and Schools Certification. Since its inception, the certifying organization has concerned itself with the safety of children and older adults. Those populations are more susceptible to the negative effects of pollutants. Every mattress meets rigorous standards for the emissions of volatile organic compounds (VOC's), phthalates, formaldehyde and other chemical fumes. Every Avocado mattress is certified for low VOC's. The sustainable, ethically harvested latex in Avocado beds is approved by the eco-INSTITUT. The eco-INSTITUT holds manufacturers to strict standards regarding toxins, emissions and ecological practices. They also require that companies adhere to standards regarding air quality and odor. Tested for by the eco-INSTITUT are VOCs, formaldehyde, phthalates, pesticides, heavy metals and more. The Avocado Mattress surpasses each of these standards, and is approved by the eco-INSTITUT. That means a natural, affordable mattress – without the harmful emissions and odors other mattresses give off. Every Avocado mattress is OEKO-TEX Certified. Oeko-Tex is an independent testing organization which ensures that the wool in Avocado Mattress is free of chemicals, toxins and harmful chemicals which may be dangerous to you, your children or the environment. The Joma wool is pure and naturally grownwith a very minimal amount of chemicals. Oeko-Tex tests confirm this. All wool in Avocado Mattresses pass tests for traces of artificial colors, formaldehyde, nickel, cadmium, and pentachlorophenol. The Joma Wool provides the benefit of a moisture-wicking, temperature-regulating and naturally anti-microbial fabric… that’s as natural as it gets. The cottons used in Avocado Mattresses are certified organic by the Global Organic Textile Standard. There are no dangerous pesticides or fertilizers used in the growing process, and each thread is spun from a sustainably harvested plant. The Global Organic Textile Standard ensures that any and all dyeing chemicals used in the process pass rigorous environmental tests, and that the workers who participate in the supply line are ethically employed under fair working conditions. Avocado Mattresses cotton is grown only on socially responsible organic farms in South India. Humanely treated workers spin the cotton at Bannari Amman Spinning Mills, which is a plant fully powered by windmills. Then, the cotton is finished right here in the United States at a processing plant in Charlotte, North Carolina. Carbon Neutral Avocado Green Mattress is taking action on Climate Change, fully embracing the We Are Still In movement in support of the Paris Climate Agreement. To this end, Avocado has calculated and offset their carbon footprint for their 175,000 sq. ft. factory in Los Angeles and one full year of product shipments. They are supporting the CarbonFund.org offset reforestation projects in an effort to help sequester CO2. It’s not just the fabrics and materials within your Avocado Mattress that are ethically, sustainably and organically sourced. 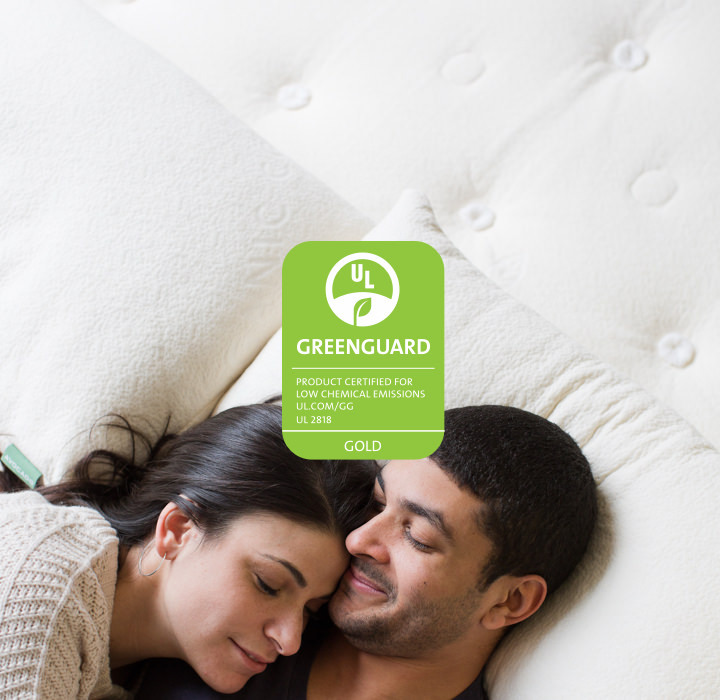 The Avocado Mattress is Greenguard Gold Certified and the company itself adheres to strict standards set forth by Green America. Green America inspects businesses in the United States from supply to finish, ensuring that products are sourced and manufactured under green, socially responsible conditions. Additionally, Avocado Mattress is a member of the US Green Building Council. That means the manufacturing process supports clean air – both inside and out. They’re also members of the Sustainable Furnishings Council. As the name suggests, this organization is committed to sound environmental practices throughout the furnishings industry. Finally, Avocado Mattress strives to keep its carbon footprint as small as possible. By manufacturing using energy efficient practices, Avocado is working with Carbonfund to reduce its carbon dioxide emissions. Every purchase made from Avocado Mattress helps to give back to the planet. Avocado Green Mattress has partnered with 1% for the Planet, a non-profit organization which focuses on six core values: climate, land, food, pollution, wildlife and water. Through the help of companies like Avocado Green Mattress, 1% for the Planet has been able to commit over $150 million in support to environmental causes since 2002. "Made with 100-percent natural Dunlop latex, natural wool, and organic cotton, this GOTS-certified, flame retardant-free mattress checks all the boxes for a healthier sleep with no off-gassing. The natural and organic materials also wick away moisture and allow for better airflow than polyurethane-based foams, making for a cooler night’s sleep." Our Avocado Mattress review certainly has a lot of good things to say about the bed. Buying your new Avocado mattress is easy. First, choose the size mattress you want. Avocado Mattresses range in size from Twin, Twin XL, Full (Double), Queen, King all the way to California King. No matter the size of your living space, you’ll find the perfect green mattress to fit your needs. Next, choose whether you’d prefer a pillow top mattress or a standard bed. The pillow top mattresses offer a bit more cushioning – two additional inches of 100% sustainable, natural Dunlop latex rubber foam. The foam is all natural and provides pressure relief where you need it most. It’s even safe for kids! The standard mattress includes 8 inches of innerspring, recycled steel coils. These coils provide a firmer support, but you’ll still feel as if you’re enveloped in nothing but softness. Last, you may choose to include a mattress topper. Sold separately, Avocado mattress toppers are made from the same organic and natural ingredients that you’d expect from Avocado: organic cotton, renewable latex and natural wool. Your mattress topper can provide even more cushioning for your mattress… or choose a firm topper to add more support. Avocado Mattress is so certain that you’ll love the product that they offer all customers a 100-night sleep trial. Order your mattress, and have it delivered to your home. Avocado’s partners will install your new bed, and will carry away your old mattress for recycling. If at any point during the 100 nights you’re not fully satisfied with your Avocado Mattress, just call the company. They’ll come pick up your mattress. There’s no cost, and you’ll be issued a full refund. When the Avocado team picks up your return, they’ll either give it to a charitable organization or recycle it. The materials used to create your Avocado Mattress are highly biodegradable, and even the steel is recyclable. Should you choose not to keep your mattress, you’re impacting the environment very minimally. However, we know you’re going to love your mattress. No matter who you are, and no matter your budget, we know you want to do your best to protect yourself, your kids and the planet. Avocado Mattress shares the belief that eco-friendly products should be available to everyone, regardless of financial status. For that reason, Avocado offers financing to customers. Avocado has partnered with a finance company to offer 3, 6 and 12 month credit options for you. You can apply for financing today and order your Avocado Mattress right away. Avocado Mattress offers a 25 year warranty on each of its mattresses. Whether you’re sleeping on the bed or your kids are, Avocado understands that sometimes things happen. For the first 10 years you own your mattress, Avocado Mattress will cover it with a full warranty. If the mattress is in any way defective or breaks down, simply call Avocado. They’ll replace it at no cost to you. From years 11 to 25, you’re still covered. If you notice a defect in your Avocado Mattress, the company will replace the mattress at a prorated charge, no questions asked. Most of our team tested out the Avocado mattress during our Avocado Mattress Review and everyone had one thing in common: they were impressed with the lack of smell from the mattress. We noticed when the cover was removed, there was absolutely no smell emanating from the mattress. This was surprising to us since we had previously used traditional mattresses. We had notable observations about the mattress. First, the bed is perfect for heavier customers. The support is spread out throughout the mattress by zones, and we felt the Avocado Mattress was supportive in all the right places. The support and the coil system, were also beneficial to those of us who slept with a “restless” partner. We could barely feel our partner's movements at night – a welcome change from our old mattresses. Finally, we also tried the mattress toppers and were pleased with the extra cushioning we got from the plush topper. One of our team tried the firm topper and said the Avocado Mattress topper gave them good back support. Athletes, older adults and back sleepers all loved the fact that the mattress “found” all the right pressure points. 5 OUT of 5 STARS - We have nothing negative to say about the Avocado Green Mattress. We’re in love with the fact that you can customize the mattress and give it 5 out of 5 Stars! We adore the fact that the mattress is free of harmful chemicals, toxins and fumes. We firmly stand behind the premise that a mattress shouldn’t be harmful to your health or to the environment. We especially appreciate the fact that Avocado gives back 1% of its earnings to environmental causes. We found the mattress to have the just right support, whether we chose to sleep on our side, back or stomach. Overall, the mattress provided perfect cushioning and ample support, and as a result we had a good night’s sleep and awoke pain free. Organic cotton, Joma wool and non-toxic materials make this bed one of the best, most organic and eco-friendly mattresses on the market. Plus, the charitable contributions of Avocado Mattress make this mattress even more environmentally friendly. Overall, we wholeheartedly recommend the Avocado Green Mattress. You’ll rest well knowing that your mattress is good for your health, and the health of the planet too.